Box Details: 18 packs per box, 10 cards per pack. Cost was a little over $20. Base set: Altogether there are 450 cards in the base set. The first 270 are found in Series 1 (which I opened) while the last 180 are found in the Update Series. I received 139 of 270 base cards for just about 51.5%. There were 31 duplicates in this box and 2 triplicates. Like always, I have to point out a unique base card. Who’s Brett Butler talking to??? Rated Rookies (1:6 packs): Found in every 6th pack on average, the Rated Rookies inserts are the easiest ones to pull in this product. There were two in this box. The first card was of Trey Beamon, who was drafted by the Pirates in 1992 and established himself as a top prospect of the Pacific Coast League in 1995. He made his ML debut the following year and played with three separate teams in three years, last appearing with Detroit in 1998. The other card was of Jason Thompson, a draft pick of the Padres in 1993. In 1996, Thompson was called up for 13 games with San Diego and batted .224 with 2 homers and 6 RBI. He would never play in the Majors again. Silver Press Proof (1:8 packs, 2000 produced): Found in every eighth pack on average are the Silver Press Proof parallels, which are numbered (though not individually) to 2,000 on the back. The difference between the Press Proof and regular base cards would be the giant foil “PP” logo in the background. There were two proofs in this box: one of Kevin Appier and one of my Eduardo Perez (one of my least favorite Baseball Tonight analysts EVER). Gold Press Proof (1:32 packs, 500 produced): The second parallel to the set, the Gold Press Proof, is much rarer and is die-cut at the top and bottom, not to mention all the gold text on the card. Like the Silver Proofs, they are also numbered on the back, only to 500. I pulled a Shannon Stewart. Armed and Dangerous (1:58 packs, 5000 produced): The best pull from this box was an Armed and Dangerous insert of Barry Bonds. On the front of this card, is a Giants logo hidden in some camouflage near the top. On the back, we have a picture of Bonds plastered on a faux military badge (link). The theme is interesting at least, even if it is Bonds. What WASN’T Pulled: There were two inserts randomly found in Series 1 Hobby packs that I did not pull any of. The first is of course, Diamond Kings (link). I don’t think I have to explain what these are. They were numbered to 10,000 that year and the first 500 numbered copies were printed on canvas. As a special bonus, if you happened to pull a Diamond King that was serially numbered 1982/10,000, you won that particular card’s original art! However, you had to be quick as the offer expired in March of ’97. The second insert I missed out on was the Elite Series (link). They were limited to 2,500 and looked awesome as always. I’ll let that scan do the talking. Have those cards ever not looked awesome? Long before the days of mini-boxes and “Rip-Master” autographs (seriously, WTF? ), Topps Finest was a pretty formidable product. Not long ago, I opened a box of 1999 Finest Series 1 Baseball. 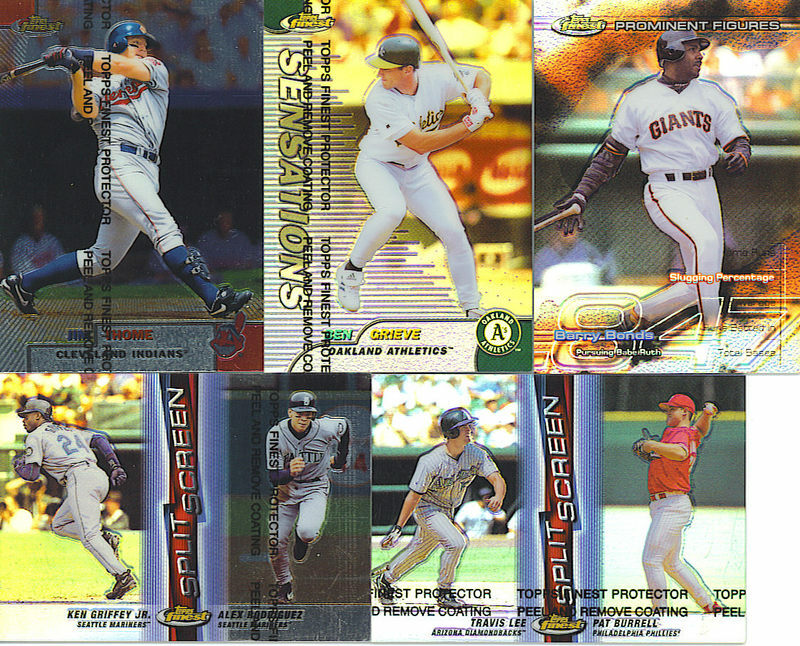 1999 Finest was a dual-series product with Series 1 being comprised of cards 1-150 and Series 2 being comprised of cards 151-300. In addition, 2 types of boxes were available. Regular hobby boxes were comprised of 24 6-card packs while HTA “Jumbo” boxes were comprised of 12 13-card packs. I went with the jumbo on this one as there wasn’t much of a difference in price and the odds of hitting inserts were more favorable. Both varieties of boxes can be had for around $35-45 or so. And on to the results…..
Base Set: As I stated earlier, the Series 1 base set is comprised of 150 cards. The first 100 are your standard base cards. The last 50 make up a bunch of subsets that feature a mixture of stars, young stars, and rookies. The stars are highlighted in a subset called “Gems.” You’ll find guys like Frank Thomas, Cal Ripken Jr., Barry Bonds, and so forth. The young stars are highlighted in a subset called “Sensations.” Here you’ll find players such as Todd Helton, Kerry Wood, Adrian Beltre, etc. Then, you have your rookies in a subset called………wait for it……..”Rookies.” Yes, it’s true. Despite the fact that the cards say “rookies,” I only got 1 true rookie, Austin Kearns. The rest were guys who had RC’s in 1997 products, like Roy Halladay and Lance Berkman. The last 50 cards are also shortprinted. You’ll find these seeded 1 per pack in a Hobby pack and 2 per pack in a Jumbo pack. In this box I received 89 of the first 100 cards and 21 of the last 50. Duplicates and even triplicates(!) were a problem in my box. Altogether, I received 33 duplicates and 2 triples, and I didn’t even complete the first 100 cards! Ugh. That was the only negative thing I could say about this box though. Refractors: Ah, yes, the stuff that makes Finest the brand it is. Back then, there were only refractors and gold refractors. There was not one refractor (and X-fractor for that matter) for every color of the rainbow like now. In this product, refractors fell 2 per box on average while gold refractors were a much tougher pull, falling in every 2.5 boxes or so, and were limited to just 100. 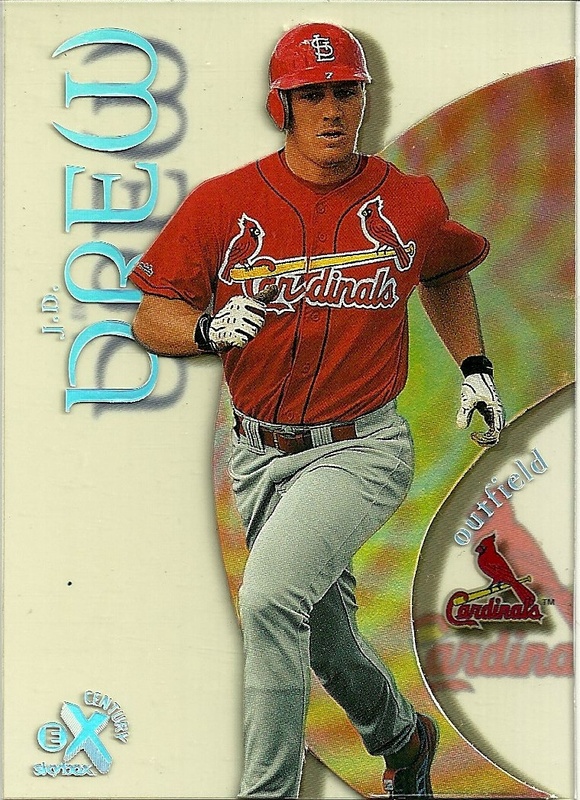 The 2 I got in this box were the refractor version of the “Sensations” subset cards of Troy Glaus and Ben Grieve (pictured above). I did not receive any gold refractors. Peel & Reveal: This insert is very similar to the Mystery Finest sets found in basic Topps and other Topps Finest issues. You received a card covered by a black sheet that you had to peel off. It was a little remeniscent of Fleer Mystique except these were WAY harder to peel off. There were 3 versions of this insert. The most common, the one that I got, was called Sparkle (use your imagination). It was of Roger Clemens. The Sparkle cards come roughly 1 per box. The second parallel is called Hyperplaid and is a little harder to find. These have the perpendicular lines on them that Atomic Refractors do. These fall roughly 1 in every 2.5 boxes. The final parallel, and the most rare, is called Stadium Stars. I’m not even sure what these look like to be honest, but they are found roughly 1 in every 5 boxes or so. There are 20 total players in this set. Leading Indicators: This is an interesting 10 card set. The player is featured with a background of a baseball field behind him. When you press down on a certain part of the “field,” a stat is shown. It shows the breakdown of how many of the player’s 1998 home runs went to each particular field. For example, on my Andres Galarraga card, I see that he hit 15 home runs to left field, 22 home runs to center field, and 7 home runs to right field in 1998. Pretty unique card, you don’t see this kind of originality anymore, and that’s sad. Prominent Figures: This is a huge insert set of 50 cards. It’s called Prominent Figures because they take 5 statistical categories and number the cards according to what the (then) single-season record was for each. For example, Home Runs cards were limited to 70, RBI cards were limited to 190, Slugging % cards were limited to 847, Batting Average cards were limited to 424, and Total Bases cards were limited to 457. There were 10 players for each of these categories. Some were in more than one category. The concept was that the 10 players selected were all deemed capable of challenging the record for that particular stat. In McGwire’s case, he set the record so the Home Runs were limited to 70. I got a Slugging Percentage card of Barry Bonds. It is numbered 443/847. For a Bonds card, it’s really nice, I have to admit. 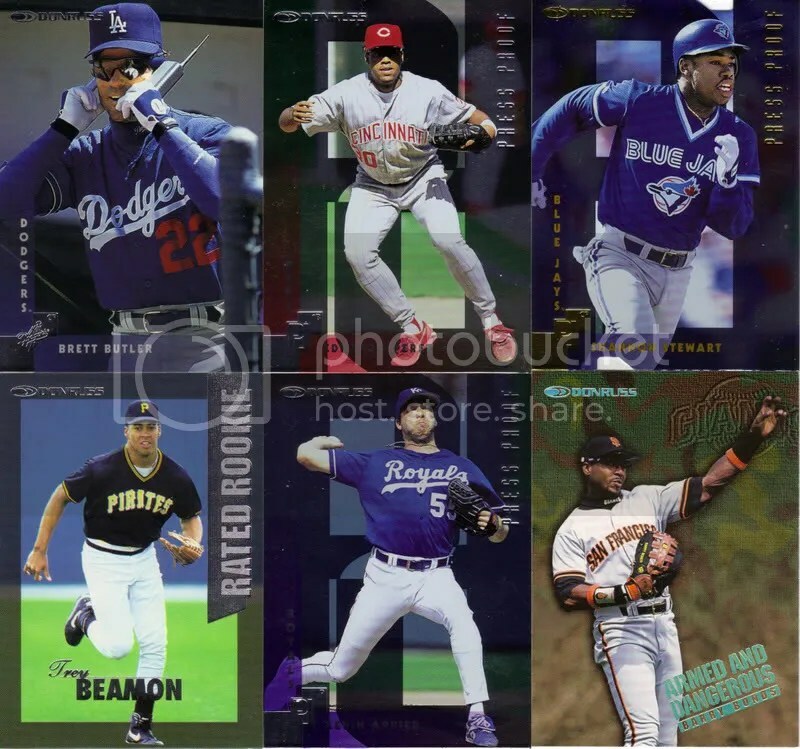 Overall, 1999 was one of my favorite years for Topps Finest. It wasn’t just a set of veterans and refractors like the early issues. It also wasn’t a gimmicky assortment of mini-boxes, rookie autographs, and an insane amount of refractors like the later issues. It was a nice medium, filled with veterans, rookies, young stars, parallels, and great looking inserts with some unique and innovative ideas. If you’re a fan of inserts, you’ll like this product. There’s some great looking stuff in here, and for around $40 or so, how could you go wrong? It sure beats the $8 jersey card you’ll get from that pack of Playoff Absolute Memorabilia of the same MSRP.